The three day Arunachal Paragliding Festival organised by Arunachal Paragliding Association concluded . The three day Arunachal Paragliding Festival organised by Arunachal Paragliding Association in support of Department of Youth Affairs came to an end with mass participation from participants from various parts of the country and abroad here at Lumdung in picturesque Papu Valley. Bir Billing from Himachal Pradesh emerged as winner of Spot Landing Competition while Omraj Gurung and Deshvir Jimi from Nepal stood second and third position respectively. The participants from Nepal, Indonesia, Canada, USA, Soulvenia and other states of the country shared their experiences regarding the potential of paragliding in Papu Valley. Attending, the valedictory function, Sports Authority of Arunachal Chairman Bamang Tago said this event will give solution to the unemployed local youths in long run. “Such kind of adventure sports will fill the employment gap where younger generation can take this platform for sustainable livelihood”, he said. Acknowledging the Arunachal Paragliding Association for successful conduct of the event, Tago assured to provide all possible help from his end to make the event more successful in future. Arunachal Paragliding Association president Vijay Sonam said after this event Lumdung has been under paragliding map of the world. He said the area has got beautiful view and potential for take off and landing for paragliding. 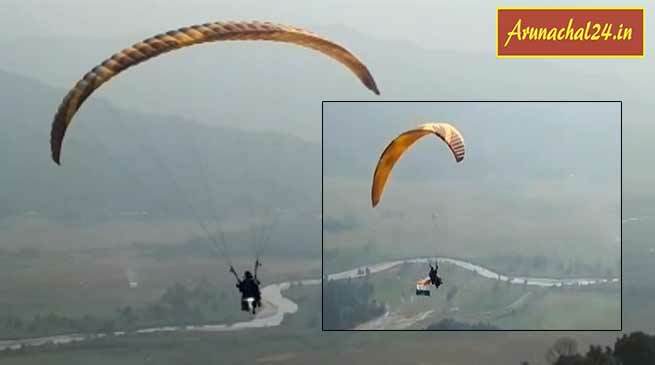 The president added that after the event, they will station at least two paragliding pilots in Lumdung so that they can facilitate whoever wants to glide in Pappu Valley. The Arunachal Pradesh Paragliding Association in collaboration with Department of Tourism will be conducting 10 days paragliding training for 28 local youths including girls from tomorrow at Lumdung.